Originally published under the title "Yes, There Is A Muslim Fifth Column In The West, And It's Time To Get Real About It." Islamists protest the arrival of Dutch MP Geert Wilders outside the British Houses of Parliament in 2009. In 2007, a poll found that 86 per cent of Muslims in Britain said that religion is the most important thing in their lives. "That's nice," some amongst us might say, including Britain's prime minister, David Cameron, and the president of the United States, Barack Obama. "It's important to have faith," they'd add. In fact, almost verbatim, both Mr. Cameron and Mr. Obama are on the record proclaiming Islam's meaning on behalf of their constituent Muslim populations. This is Mr. Cameron, just hours after British tourists were slaughtered by radical Muslims in Tunisia this summer. And here's Mr. Obama, saying "Islam is a religion that preaches peace." But even if you do believe those things. Even if you have read the Quran cover to cover and you come out thinking, "Yeah, fair enough, that wasn't so bad," there's no doubt that Islam is a core component of radical, terrorist ideology, and perhaps just as concerning, of fundamentalist, non-violent, segregationist, and intolerant politics in the West. Islamism is both an immediate security threat and a longer-term cultural threat to the West. The reason the first is bad is clear. It will remain clear to those wounded and their families, and not least to the families of those who died in this weekend's terrorist attacks in Paris. The second has to do with a more long-term, disturbing kind of cultural attack on the West. In schools across Europe, young Muslims are taught Islamic fundamentalist values. In mosques, often sponsored by hard line Pakistani sects, or indeed the government of Saudi Arabia, Muslim kids are taught not just things that don't fit with Western society, but things that are anathema to it. 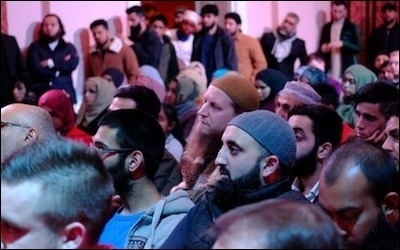 In the past few days, Breitbart London was the only news outlet in the country (before the Mail pinched our coverage) to report from the extremist-riddled "Quiz A Muslim" event in Bedford, just 50 miles north of London. As some of the country's most radical hate preachers convened a major conference, their caliphate-wishing counterparts in Paris were preparing to shoot up restaurants and cause carnage on a scale not seen in France since World War II. These people are inseparable. Their core ideology is the same. 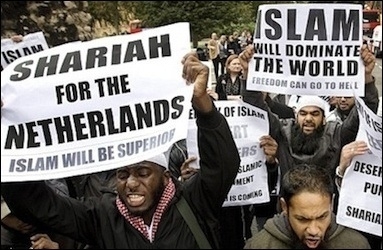 They want an Islamic caliphate spanning the Middle East and North Africa. And if ISIS's demands are to be taken seriously (and I suggest they are), they want it to expand into Europe too, starting in Spain, or what they call "Al Andalus." It is these kinds of "non violent" events that radicalise young Muslims in the United Kingdom. From women wearing the niqab, belief in the caliphate, wife-beating, and putting one's loyalty to Allah over the loyalty to one's country, these people embody and epitomise what UKIP leader Nigel Farage once called the "fifth column" living in our midst. In 2007, the same poll I mentioned at the beginning of this article found that 36 per cent of young Muslims believe that leaving Islam deserves death. Thirty-five per cent of Muslims in Britain want their children to be sent to Islamic-only schools. Twenty-eight per cent want to live under Shariah law in Britain. And 74 per cent of 16 to 24-year-old Muslims want Muslim women to wear the veil. There is, most certainly, a fifth column in our midst that wants to drastically alter our societies. These are not insignificant figures. And the problem is clearly with the young in this country, radicalised maybe through schools, universities, or at their mosques. We can say, of Britain's population of around three million Muslims right now, around one third have definitively split loyalties – and that's putting it mildly. In 2007, seven per cent of British Muslims said they "admire organisations like al-Qaeda that are prepared to fight the West," with the figure rising to 13 per cent for 16 to 24-year-olds. So yes, not all Muslims are extremists, or terrorist-sympathisers, or radical fundamentalists. Pick your term. But there is, most certainly, a fifth column in our midst that wants to drastically alter our societies – and a not insignificant number who are willing to show support for terrorist organisations that are willing to kill to reach that goal. It's time to get real.